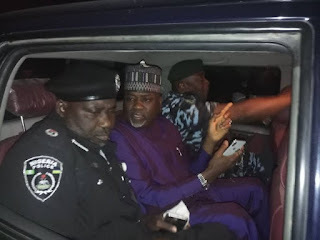 Police in Kano have taken the state deputy Governor, Nasiru Gawuna, and the state Commissioner for Local Government, Sule Garo, into their custody over alleged threat to public peace. It was gathered that the two were arrested for alleged disruption of the collation of results of the Governorship Elections at the Nassarawa Collation Centre. It was gathered that the two were saved from being manhandled by supporters of the main opposition Peoples Democratic Party (PDP) candidate, at the Centre. The incident, which took place at about 2:00 am, was said to be responsible for the delay in releasing the final tally of the Kano State governorship race which is likely to decide the winner of the keenly contested poll.